Gail — Reading this was very important for me as a reminder during my stressful life following multiple concussions. Thank you. Jess P. — I really needed this reminder, Craig! Thank you! Robert S. — Thank you for posting this. I am sharing it with friends to help educate them about life after brain injury. Marcelo V. — Thank you Craig as I found your video very interesting, helpful and with many tips that you mention that will indeed help me alot. 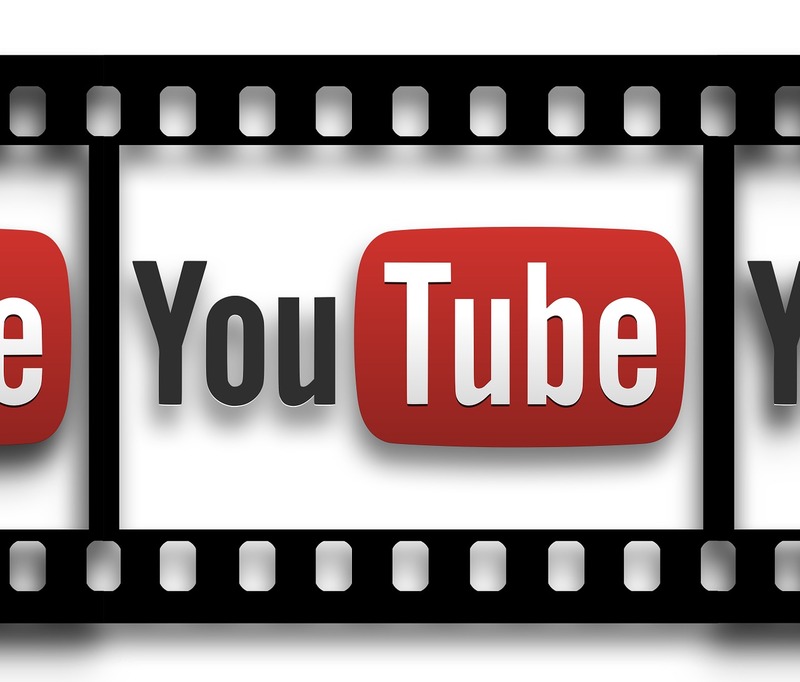 Luis F. — Never stop uploading video! Please you help me through the day! sizzlebiskits — Hi Craig, I am so grateful for your videos. Your message is amazing. You have given me hope and insight over and over again. Thank you. Gaya T. — good presentation learned a lot from it thx for all the hard work and also for posting this! 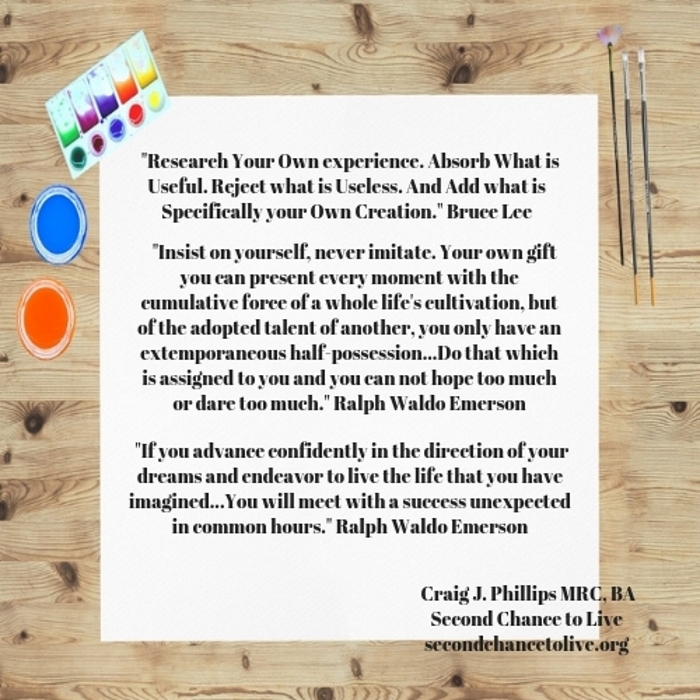 Bill J.–Excellent inspiration Craig J. Phillips. Thank you! Devereaux M. — Thank you for this great post. To Live Beyond Limitations Through Humility — Part 1. Dana K. F. — A Second Chance to Live has helped me learn about myself, how to cope with my brain injury, and has encouraged me. Craig J Phillips is an excellent motivational and inspirational speaker. He has great knowledge and can relate to other survivors. He is very kind and caring. In his videos he speaks about his experiences which gives me great hope. 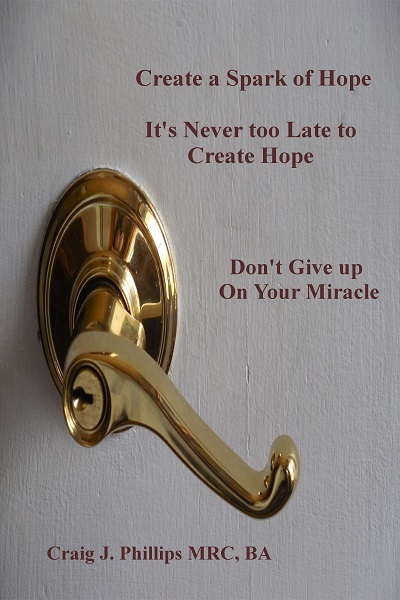 Nelly V. – Never ever give up there is good if you keep fighting for it. Marina A. — I wanted to get back to you and let you know how extremely helpful and informative I have found your site and your articles to be. Your messages are full of hope and support, which all TBI survivors need at some points in their journeys. Thank you very much for your time and support! Gary G. – Your posts on second chance to live have helped me considerably, in the beginning they helped me to come to terms with my limitations but also gave me hope to rebuild my life and work on the positives and work around the negative now your page helps me pass forward the information to help others in my position, your page is a lifeline for people with head injuries, kudos my friend. Linda S. — another “home run” information Craig thank you. Terry S. — You are such an inspiration to others , I love seeing your posts, thank you. Peter K. — You’re a good man, Craig. Your posts are massively helpful to many, myself included. Be safe Love you, brother. Sarah J. — Once again, you have shared a much needed topic. You are an uplifter and reminder to keep looking on the positive side. Dnice G. — Thank you, much love from me in Sweden. Steve A. — Craig, thank you for this post. No, wait. Thank you for all your posts. You are a blessing to so many. Thank you for giving your time to make so many lives count in this world. You are a true blessing. Dana C: Thank you very much for this message. 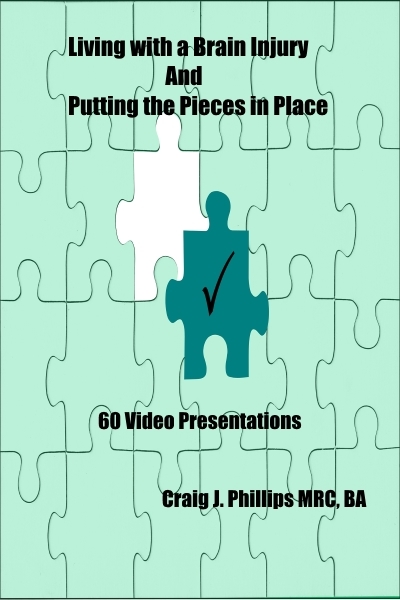 Adrienne H. — Dear Craig, I am very happy to have found your video presentations and website. I have already watched a number of your videos and read several of your articles, and they are so helpful for me. I subscribed to your You tube channel too. You speak and write about many issues I am struggling with as someone else with traumatic brain injuries, and I am grateful to you for sharing what you have learned and come to understand. Thank you for sharing your knowledge and hope. I wanted you to know that you are helping me. Thank you for being such a great resource and inspiration for others who’ve had brain injuries all around the world. With gratitude, Adrienne H.
Melissa B. — This is beautiful and such an inspiration and reminder to continue to fight for your life. That we are worth it. We are worth our life and happiness in it. Trina B. — Thank you Craig! I appreciate your thoughtful, encouraging writing! Joyce K. — I Love the pic of the Brain Lifting Weights to get stronger! Your article is easy to Read & done very well. Thank YOU! “Absolutely amazing and empowering post. I have spent many years advocating on my job for people with disability. I needed to hear this myself today. Thank you.”. Marina A. — Thank you for your new waves of thinking and insight. They are like clam and soothing waves during the continuous brain injury storm! Mark W — You are a blessing, thank you for what you have created here. It is so helpful and so meaningful. Thank you, thank you. Dolores L. — Your story is more than a little bit amazing, you definitely are not a mistake! You are mightily magnificent, having fortitude and faith few have achieved. You are a superhero to the max! Amen. Lisa S. — You are amazing! Living with a daughter with all of the struggles you outlined here, I know a little (just a little – from a caregiver perspective) about what you face daily. So, I also know it had to take a huge amount of your reserves to put this together for the benefit of others. This is so helpful, thank you! I am grateful and know so many others are as well. Wishing you great blessings this year! Marina S. — Your articles, eBooks, and video presentations have opened a new door for me into reaching out, supporting, and advocating for TBI survivors via Facebook. Your stories are inspiring and full of hope, promise, and passion. Dana K. — Craig my friend you have been my inspiration. I have always wanted to help others and you are actually doing so. Craig honestly, if you bottled that can do attitude off yours we could sell it as an essence of the best of humanity, and we would be rich until then keep doing what you do cos you make people better just by being yourself which for me, and no doubt others make the day that little bit brighter have a great weekend brother, Gary. Kevin M. I don’t have a tbi BUT, know that so much of what you do and share apply to people like me in the MS community. Continue your work, it reaches farther than you know. Jeff L. Love your articles & video’s, I have to admit that I haven’t read too many of your eBooks but I don’t read much! My Brother… Please don’t be discouraged because the things that you post are wonderful & trustworthy!!!!! You do help probably more than you will ever imagine!!! We love you brother!!!! Keep up the good work!!!!! Terry G. Craig You are helping so many people And I feel that this is what God wants you to do so Craig keep doing what you love to do.God bless you my friend We have a second chance in life to help others. Viki K. We don’t always know where our goodness flows, but I know that your good heart, good words, and good insights are rippling through the world. You definitely make a difference to me and many others. Nancy M. You have been an inspiration to me since I first met you at Caldwell and heard your story of how you overcame such great obstacles to be here you are today. Keep up your articles and advice as you never know how many folks you may help. Blessing and peace be upon you. You helped me with an inmate many years ago. He felt terribly alone and prison was no help at all. You encouraged him and helped him immensely. I have lost touch with him but for some reason lately he has been on my mind. I will find him and let you know how he is. Thank you for your insight. It has helped me understand so much which in turn helps others. Lorraine M. I am always inspired by your work. You are always growing, always learning and always focused on helping people. You don’t know what an inspiration you are. Mindy B. 10 1/2 years is a long time. You put a lot A LOT of effort into this! I have learned more from reading through your posts than from anywhere else I have looked in the last 3 years. Often I can’t even open them (my phone) but s FB then I write down the basic info. Debra G. Craig your articles have helped me be me in my daily life. Mostly when watching my nieces. I have used your words to help encourage them to do their best in school and help me to move on in my life. Hearing about how orthe things you’re doing to help others pushes me to do the same. No one is perfect but as we move on in our life and do what we feel we need to do for ourselves to grow or to live each day our words come to us. Your passion has helped a lot in my daily life as well. Thank you for every encouraging word you have written and shared. They help me to push forward each and every day. Brett B. Hey Craig, Your friendship has been awesome. Your articles in particular have introduced me to Neural plasticity and your own experiences working in this area have given me new tools and perspectives in many areas of my own life. Jo D-D Craig, I fully appreciate your posts and the positive way in which you write. The tips you give are useful and help me still, 17 years post injury. Thank you and please don’t feel discouraged, you are helping many people. Daniel K. Craig, I have read you wonderful piece of literature. I do have a question which I will get to shortly. You touched on many subjects that, after many years, I have come to realize are true. I am almost 24 years post TBI. So, for the first 15 years I followed and did what others felt was best for me. Now I am doing what I feel works best for me. How do you manage to keep a positive outlook? Lisa V-O. Thanks Craig! I now have subscribed to your blog because I need to be reminded of the posiitivity in my life. I can do so much more in the 7 years since my anoxic BI but sometimes I get bogged down with the can’ts. Mary B. C. Craig, Thank you for sharing the links to your knowledge and resources with me. They will be very useful and helpful to me and people I share them with. Thank you for helping to make living with a brain injury less complicated and more productive and successful. 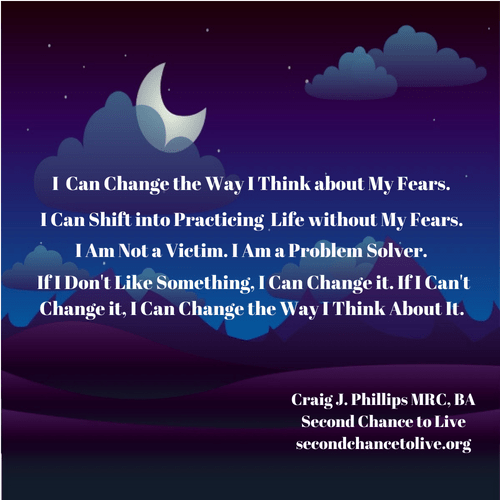 Craig J. Phillips’ Website “Second Chance To Live” has been an extremely encouraging part of my healing process from having Survived three Brain Surgeries. I have undergone three Brain Surgeries to remove a Brain Tumor. Those surgeries successfully removed the tumor, but left me with some cognitive deficits. Craig’s videos and articles have helped me stay positive and encouraged through the difficulties that those challenges have presented. After I realized, through my personal acquaintances, that there are many people struggling with similar issues, I created a Facebook Group for individuals who have survived Brain Trauma. I am a primary, founding Admin of two Facebook Groups for individuals who have survived Brain Trauma. I have also founded a TBI Resources Page on Facebook, which is entirely dedicated to sharing information about Financial Assistance programs that are available to individuals who have survived Brain Injury. Craig J. Phillips is an excellent role model, showing others by example. I’m thankful that Craig shares his articles and videos in the Brain Injury Support groups that I Administer on Facebook. I personally find Craig’s articles and videos encouraging, and I know many of the other members of my groups do as well. I would like to say, Thank you to Craig, for the positive, and helpful information that he shares! I met Craig at the Dowd YMCA and quickly learned just how special of a person he is. His testimony is inspiring and has motivated me to look at obstacles we face life as being merely parts of the journey, and not the destination. I was so compelled by his story that I even offered to help with a video that highlights the benefits of the exercises he performs on a regular routine. He brings joy to the faces of everyone he meets and continues to bless each and every person he comes across. For him to go through what he did and to be where he is now, is truly an inspiration! Gary Gillian, May 31, 2017 9:15 a.m. Thank you for sharing your story with us! Your talk was helpful! Really enjoyed hearing how the movement with martial arts helped you! Great speaker! Loved the examples of skill he built over time through perseverance. Thank you for sharing your faith. That was encouraging. An excellent speaker who describe his experience well- he provided great encouragement from his experience. Encouraging to hear from Brain Injury survivors. Humorous and likable. I appreciated Mr. Phillips sharing his story. His passion for living life to the fullest and desire to help others is inspiring. Thank you. Thank you for presenting. You are an inspiration to others to have hope and persevere! Thank you! I have had the pleasure of knowing Craig for about over 10 years. We would run into each other at the YMCA here in Charlotte, NC. That is where I have taught my two fitness classes for the past 15 years! Craig can be found usually going through his sequence of martial arts workouts in the corner of the gym. The intensity at which he trains himself can capture anyone’s attention as they walk by. So it was only natural to strike up a conversation with him. I was equally impressed with Craig as he shared with me his personal stories of overcoming his injuries to achieve success in his martial arts. Over the years I have watched him develop into a person who is determined to meet any challenge that comes his way. There were times where he could have given up, but Craig’s will to ‘not to be the problem’ but the solution spurred him onward. I am blessed to have met such an individual as Craig. He is definitely a role model for anyone who is trying to overcome their personal liabilities. I have nothing but the highest respect and regard for this man. Craig, you are an inspiration! Your words help lighten the load a brain injury can bring into our lives. Thanks for challenging us to think outside the box and see the forest and the trees! People like Craig Phillips are a unique breed. I’ve known Craig for many years in the context of the brain injury community where he has been an active participant for many years. Craig has evolved as a teacher and a guide to people who are embarking on the journey of living their lives with a brain injury. As a teacher, Craig provides life lessons by sharing his own growth and self-awareness. He encourages and supports the steps leading to action and enhanced self-knowledge. 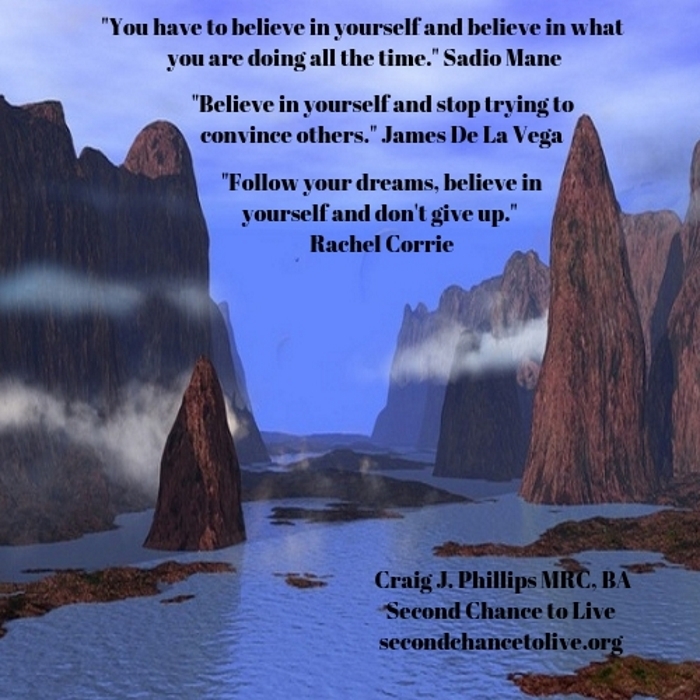 And, as an accomplished life coach and guide, Craig suggests that each person treat the steps they take in their life as part of a work in progress. 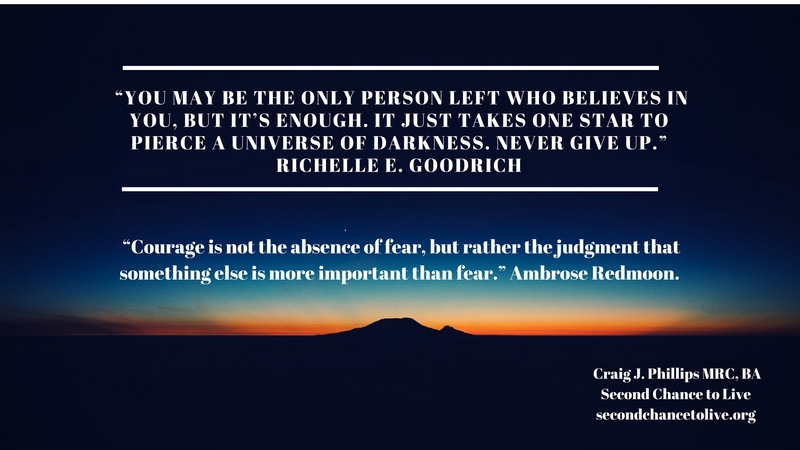 Perhaps, most important is Craig’s message to live to find hope. Recently Craig and I shared some communication via email. He told me that he has made two of his e-books available to the public: Being Your Own Hero Through Overcoming Adversity: Tools for Rebuilding Your Life and Living with a Brain Injury: Putting the Pieces in Place (60 Video Presentations from his Second Chance to Live Channel). Craig wanted to make readers of NeuroNotes aware of the increased availability of his two e-books. He has a strong desire to make information available to people living with a brain injury. I was pleased that Craig asked me to tell our readers about his books. With his customary thoughtfulness for others, Living with a Brain Injury: Putting the Pieces in Place was designed to put his articles into a video format for people who find that more accessible than reading. 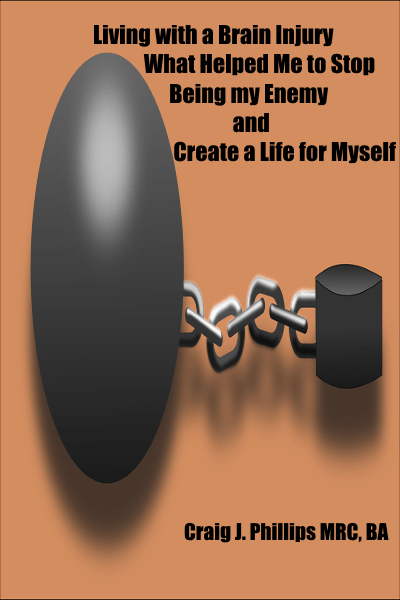 In Being Your Own Hero Through Overcoming Adversity Craig created short, focused life lessons addressing challenges and opportunities for growth which are of tremendous value to all people. Craig is adept at using his own journey as the teaching example and provides effective tools for increasing awareness and growth in each vignette. Craig Phillips, like Daniel Bax , George Visger and others who have contributed to NeuroNotes , is a member of the group of people known as Brain Injury Thrivers. They have addressed and continue to address challenges in their lives and take the time in their journey to help others find opportunities. I am pleased to know them and to share their work with you through NeuroNotes. Craig encourages people to visit his website, A Second Chance to Live and to use his e-books. My friend, esteemed fellow survivalist, Craig J. Phillips, has inspired me to address Acquired Brain Injury (ABi) via mainstream social media, as I actively confront the many perceptions of daily living with invisible impairments. Thanks to Craig’s courage I am calmly on my way to feeling comforted by my own words, after nearly 7 years. Instead of being ashamed of the deficits I endure daily, I am happy to open up today. This was not the case in previous years… Now, I learn about ways to positively deal with the adversity of traumatic experiences. Craig also creates videos that can shine light on the challenges we face with ABI. 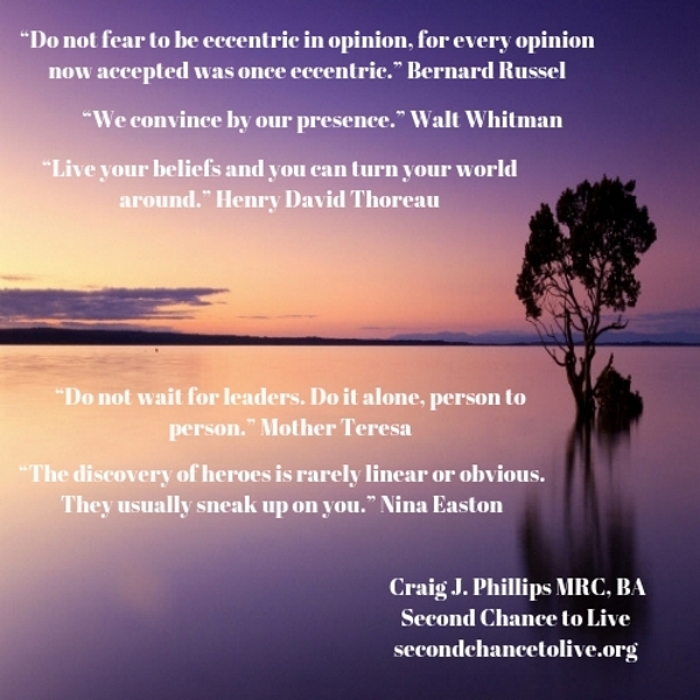 It was not a specific piece that he had written for “Second Chance To Live”, rather the consistency of the writing component of his personal advocacy, that were of most help to me. As a new parent and spouse to a loving partner (who has also been my primary care attendant, since we met in 2009), I was searching for a person “who may get it” without attending support groups… During the last few years, I had found compassion through a LinkedIn contact. Who just happens to get it completely. For more than a year, I have closely followed this friend, who offers wisdom in the inevitable daily struggles of ABI. Craig has shown me a side of myself that I thought had died in a motor vehicle collision years ago, and that: there is hope in the darkest corners of depression; if you seek the help you need, it shall be available in time; people are capable and neuroplastic. On behalf of our Home Care and Healthcare Advocacy community, I applaud you for your inspirational message when overcoming perseverance in your life time. The poignant message you’ve shared with us is an inspirational message for all people to work hard when overcoming adversity everyday challenges in life bring people. 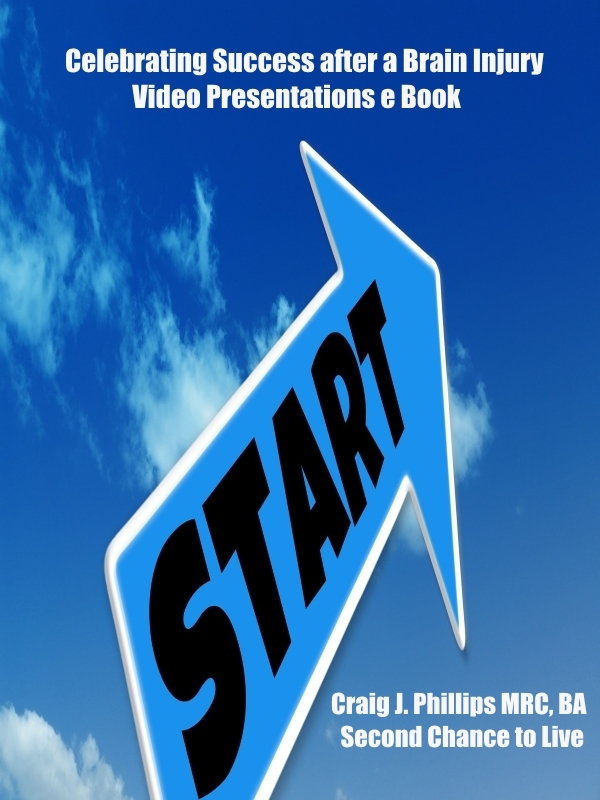 After obtaining your graduate school education, you’ve found your niche with publishing almost 1,300 articles and over 200 video presentations. If interested, I encourage interested readers of our discussion to share your inspirational message to lift the attitudes of countless people across-the-globe who might be down on their luck because of being diagnosed with a terminal or chronic medical condition. I thought Sue’s contention was insightful because the ‘modeling of your grief process’ can be utilized as a framework for others in learning how to adjust to the daily challenges we all encounter in our life times. I now opt to conclude with your earlier uplifting quotation because this is an inspirational message to continue moving forward through the odyssey of life. Thank you to everyone for your participation on our Home Care and Healthcare Advocacy group on LinkedIn! Craig’s message is universal. 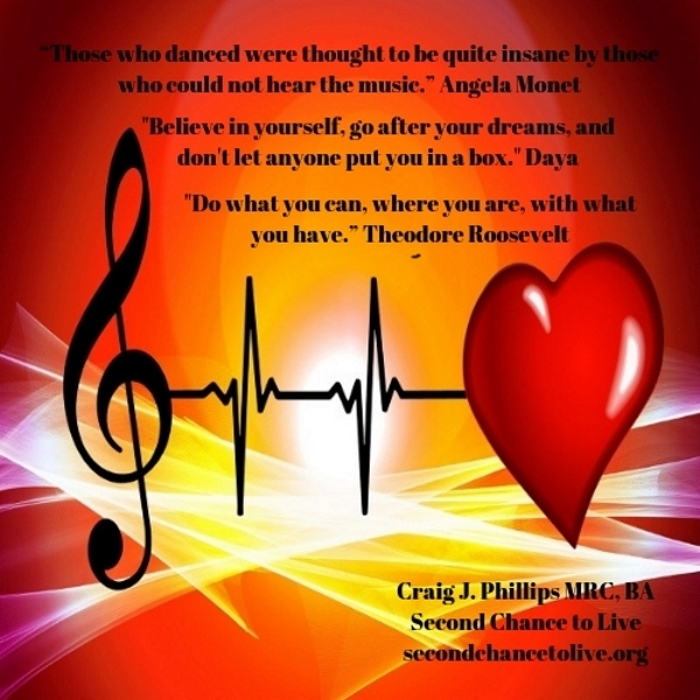 “You can find your way thru tragedy and build a new life.” It may not be the life you had before, but Craig’s message of hope, empowerment and love can help you discover your second chance to live – and live well. I am grateful for Craig’s beautiful writings. They inspire me and bring me comfort. As a speaker, Craig, speaks from the heart and is a living testament to his message. I am honored to know and learn from Craig Phillips. “While listening to Craig a light bulb went off regarding my son who experienced a TBI (unknown to me) in middle school and some thing that may help him” and “I was extremely impressed how he showed us how determination is usually all it takes. I appreciate your story tremendously” and “I learned more about individuals with brain injuries” and “keep after your goal”. In October 2013 I was asked and gave a keynote presentation at the Southwest Conference on Disability 2013 in Albuquerque with the University of New Mexico. I spoke to approximately 600 – 700 individuals. Craig Phillips is an exceptional person who has constructed his life to help others. I had the privilege to meet Craig, in person, at the Southwest Disability Conference in Albuquerque, New Mexico in October 2013 where he was a keynote speaker. I had known Craig prior to that conference through his website and on-line presence where we had the opportunity to interact and learn about his work. What is impressive about Craig is his forthright manner about discussing his brain injury, it’s impact on his life and his devotion to helping others through Second Chance to Live. Craig has written a blog on our NeuroNotes which has brought his work to others living with brain injury. 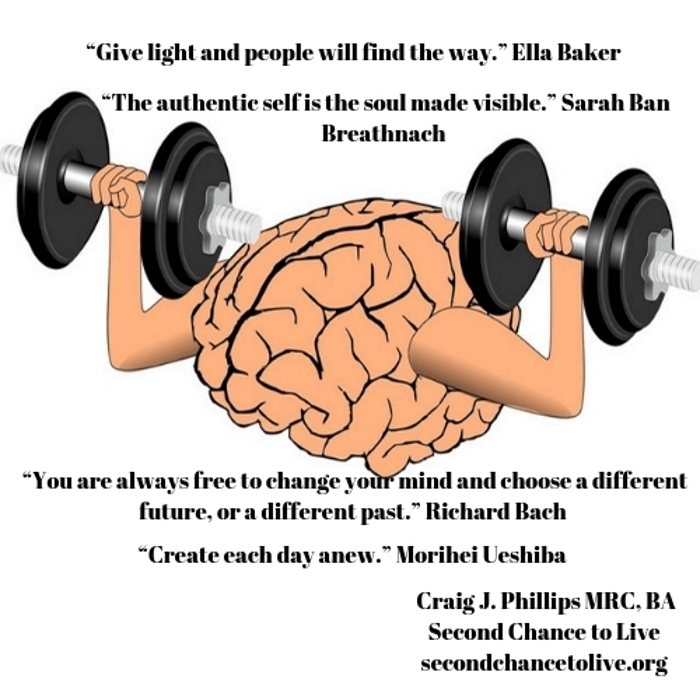 Craig J. Phillips, MRC, BA, has experienced a traumatic brain injury and through his journey he has created a website A Second Chance to Live which offers each visitor a unique resource for living with brain injury or other invisible disability. Mr. Phillips provides a rich personal exploration of the challenges and barriers he faced in his life following his injury. Each of his teachings are filled with introspection and good sound advice. Craig, you are a brave inspiration to other Brain Injury Survivors (myself included) out there! I am legally blind, but your video’s have touched me in so many ways. It is as if you are reading my mind at times. Bless you for what you do to pay it forward to other Survivors! 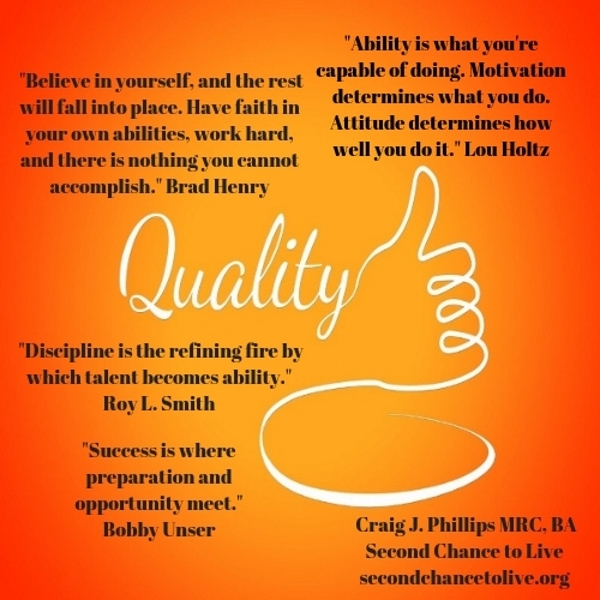 I am very impressed with Craig Phillips’ work, articles, and information especially on the “Second Chance To Live” website that he founded, and authors all articles of very valuable information to not only brain injury survivors but also to those that serve this population and their families. Craig’s passionate desire to inspire others such as myself as a brain injury survivor by choosing to reach out through his own hardships and sharing with a community of friends who so need what he has to offer has helped educate me regarding the Grieving process after TBI, relationship issues and conflict, and most of all about my rights and services available to me as a TBI survivor. Through Craig’s mission to help others, i have learned most of all that I am not alone and his ministry is touching the hearts of so many across the globe. I am grateful for our connection through my Case Management Services and connection with the Community Futures’ Foundation in Richmond Virginia. 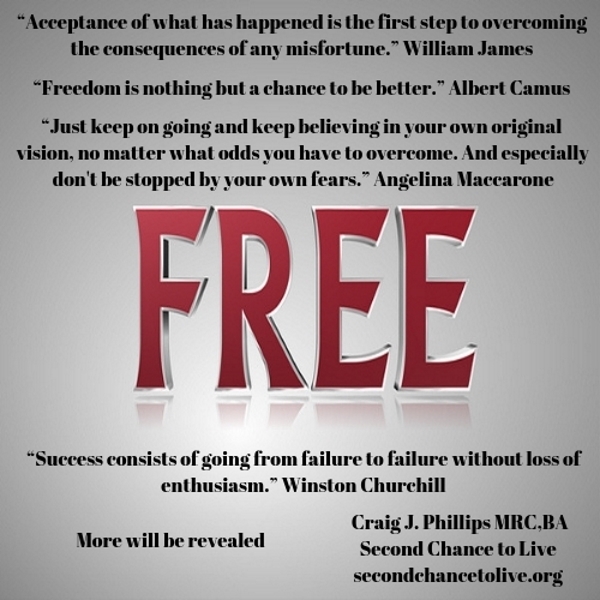 I am honored to help Market Craig’s website on wordpress.com called seconchancetolive.org because I share in his mission, goals, and vision. The work that God has chosen to do through Craig, I believe will travel the globe and bless multitudes of people from all walks of life. My injuries have been accumulative over the years until a car accident of 2005 complicated an already difficult to manage illness-Traumatic Brain Injury. I was not aware of the resources and help, so I was not given much of it until a job transfer in Social Work and Counseling warranted my transfer from Wytheville Virginia to Richmond Virginia. God has blessed me with a strong support system through the Community Futures’ Foundation here and via their links I was connected to Craig and secondchancetolive.org. 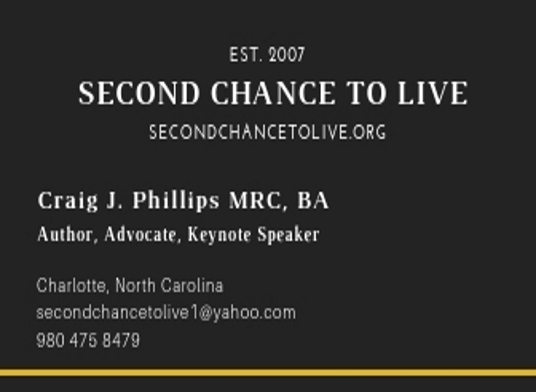 Friends, I hope you will support this ministry by connecting and subscribing to Craig Phillips wordpress.com page today called secondchancetolive.org where you will find 800 articles on advocacy, education, and resources of not only brain injury issues but dealing with grief, loss, self-esteem issues, and many more. Please connect and be blessed today and allow God to minister to you right where you are on your life’s journey today. 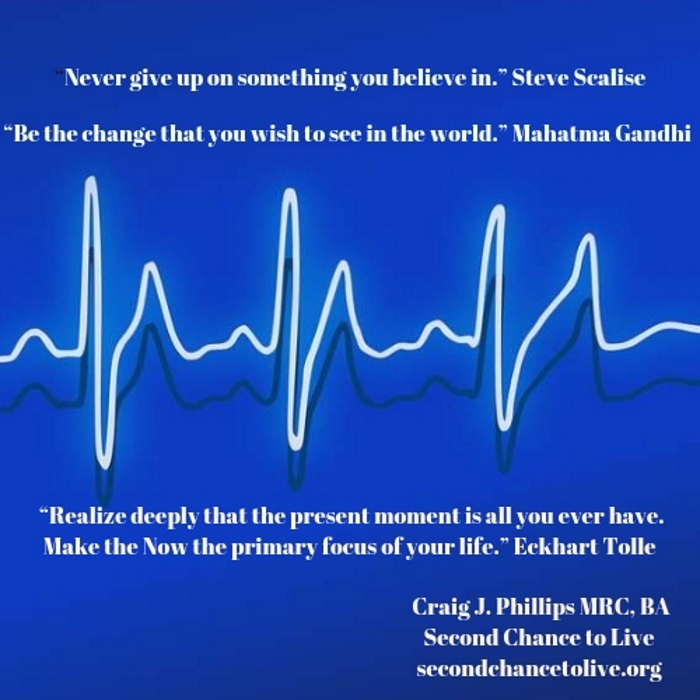 Peace and God Bless to Craig Phillips, secondchancetolive.org, all brain injury survivors, their families, communities and organizations that serve brain injury survivors, and YOU! I do not have a ‘disability’ other than being human, and I find your words extremely encouraging for every day rigors of life. Maybe disability isn’t really a disability, it’s an opportunity. One that all of us ‘abled’ people could learn from as well. The opportunity to find out that none of us are really that different from each other. No matter what life throws at us, we can stand up and move forward, together, and get there, or not. It’s a choice. And, in the end, we are not that different, in that we experience the same feelings of joy, accomplishment, defeat, determination, perseverance, love, comfort, general pissed-off-ed-ness. All these moments make a life worth living. Please keep up the good work. I feel so blessed to have found Craig’s Second Chance to Live site. His writings have been an inspiration to me. He’s gotten me through feeling worthless. I too am a traumatic brain injury survivor. I had a great career at an advertising agency. That presentation is amazing. I just wanted you to know that not only has second chance given me courage through my journey. It has also given me hope through a world in which I tried to mask myself with denial. Not only did I mask I hid myself from others due to embarrassment and confusion. Because I didn’t want others to know that in the worlds eye that I was less than everybody, and it hurt me. It hurt me because of not having humility to humble myself and say I need help. That just led to people coming and going, in & out of life. You have given me new insight with your website which is very encouraging to me and others with an unseen disability. Because of your encouragement I will never look down at myself again, no matter how arduous the journey is. That is to say with a relationship with God and family I am able to walk this out, and it’s been difficult at times. Brain injury is tough, and its even tougher when you don’t have others that understand or others that simply say that’s not possible, your making this up, it can’t possibly be that hard. I’m sure you’ve heard discouragement from others in family and outside of family too. It’s like they don’t want to see you now. They want to look at how you were before the injury. That to me has been difficult. I’m still Loyal, but not the same as I was pre-brain injury, and that is where the line of distinction is. That recognition has not happened for me with all family or friends. To have a friend such as yourself that knows personally how devastating things can be, and to keep a positive outlook despite what you’re going through goes a long way. Thank you so much for everything that you do to encourage people like ourselves, and just keep up the good works. I hope that everything is blessed for you & yours always. God bless you! Jennifer Vanella Soprano June 12, 2011 at 2:30 pm Ex, director Jmvrainbowvisions Inc.
Craig Phillips’ ‘Second Chance to Live’ has been a most welcome support to my own travels through the confused-and-confusing world of recovery from/with traumatic brain injury (TBI). This experience is a huge, at times unwieldy and frustrating “process” (my own recovery is now in its 23rd year). I have found his words to be extremely supportive to me personally, in providing a source of invaluable information and support from one who has, in his own remarkable life with the injury, experienced so much of what many BI survivors have experienced/will experience. The nature and quality of the man’s *heart* is readily apparent in the comfort he supplies to our community. Thank you for your support with TBI! Your feelings and truth have helped me as a parent beyond imagination. I am sad that one has to endure such a great defeat but on the other hand excited that God has chosen only the strong to move forward with TBI the gifts that have been given to each TBI survivor are unwrapped around the world because of great people like you. Craig’s work on Second Chance to Live is a lifeline for those living with traumatic brain injury, as a survivor or a loved one. Craig is gifted and prolific. What stands out the most, for me, is that the articles are short and to the point. 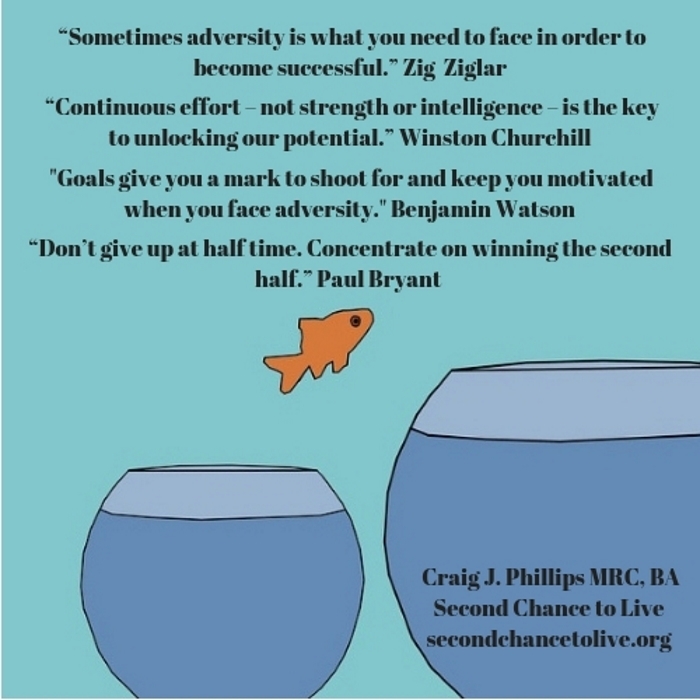 Reading long essays is challenging for me, but the articles at Second Chance to Live are manageable and the content is easy to follow and understand. So far, after following Craig’s writings through a Twitter feed, for a couple of months, I have learned a great deal about brain injury and I find it comforting to know that someone else understands me, and what I’m going through, on a daily basis. 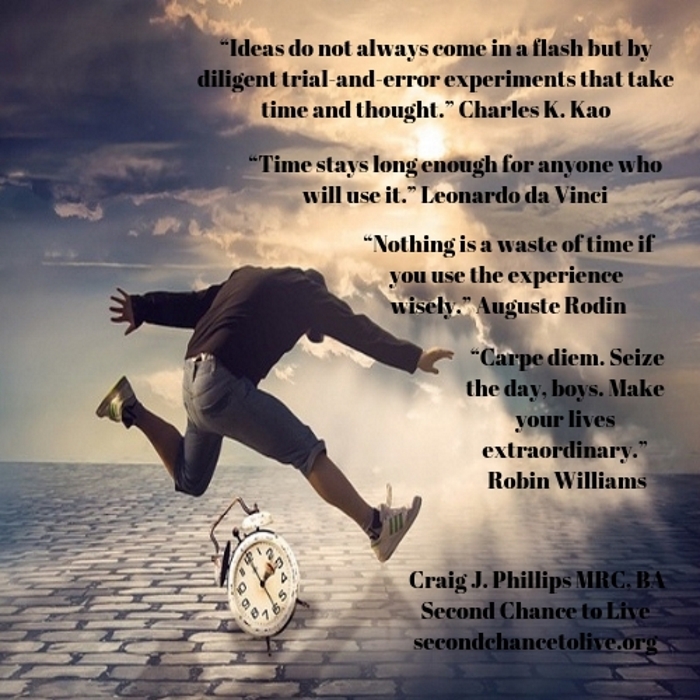 I highly recommend following Craig’s writings on Second Chance to Live – he is an asset to TBI on the Internet. Thank you Craig. I wish I had Second Chance to Live to read after my brain injury 33 years ago (December 31, 1976). Your words and insights are doing a great service by helping people with brain injuries and their families better understand many of the issues we live with on a daily basis. As many of us who live with a brain injury know there is no silver bullet or magic pill that will make things better – QUICK. Our recovery is a slow process and Second Chance To Live makes this process a little easier. Second Chance to Live is a great tool for those of us who provide Peer Counseling to others with brain injuries. Your efforts also offer hope and hope is something we all need as we go through this process. Hope is something that gets stripped away over time and without hope it makes the process of recovery harder and more complicated than it needs to be. 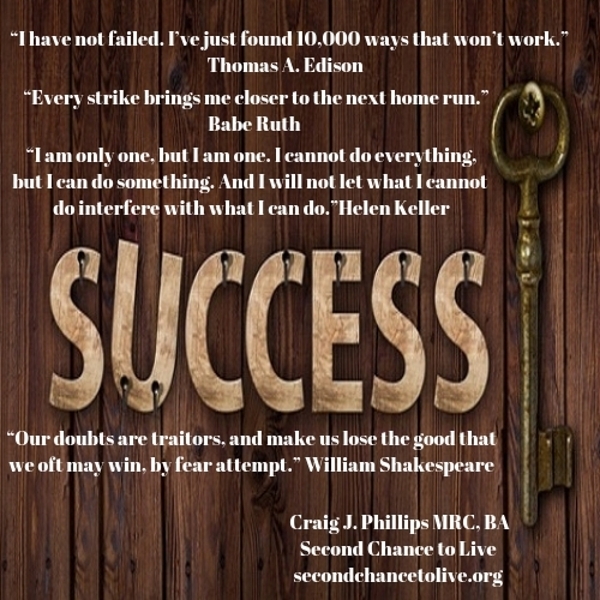 Thanks Second Chance to Live for providing hope! Keep up the excellent work you have undertaken on this journey of helping to educate “all of us” about brain injury. I had a TBI on 9/16/07, as the result of a car accident. I was airlifted to a hospital and my broken bones were repaired there. Several other body parts required medical attention and after coming out of my coma I was transferred to a nursing home/rehab facility. I wasn’t made aware of my TBI until two and a half months after the fact. I knew that I wasn’t “right” but I didn’t know why. I spoke slowly and had trouble putting my words together among a multitude of other thoughts, behaviors and physical changes that I’d not experienced before. I’d always thought that the saying “Of all the things I’ve lost, I miss my mind the most” was funny. It was no longer funny to me, it was too true of me! I’d re-learned how to eat, walk, and talk. Now it was time to really use my head. Somebody had brought my laptop computer to my room. “The old me” used to read and write a lot on my laptop. After months of not using my computer and having memory problems, I found that I had a great deal of difficulty just trying to remember stuff like my user names and passwords. It was then that I realized that I had to start all over. After I rediscovered the benefits my computer had provided, I knew that I had to learn more about brain injury. Family and friends made a point of saying that I was given a second chance to live. 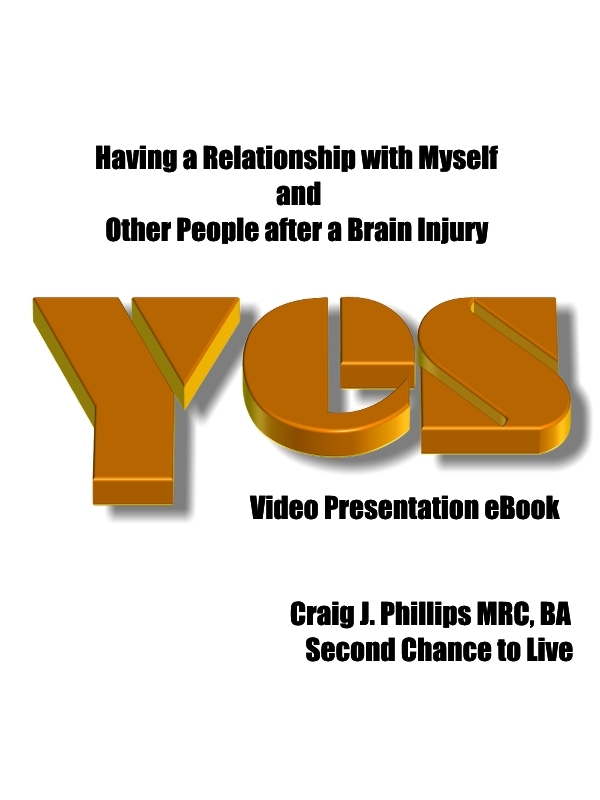 I then learned about brain injuries and came across the Second Chance To Live website. I had finally found what I didn’t know existed; a candid website written by a brain injury survivor. Craig’s honesty and candor and insights have kept me grounded. I believe that God blessed me in a very personal way by letting me be exposed to a real life guy with a BI(Craig) that experiences hardships, successes, disappointments, self-doubt and self-discovery in everyday life. 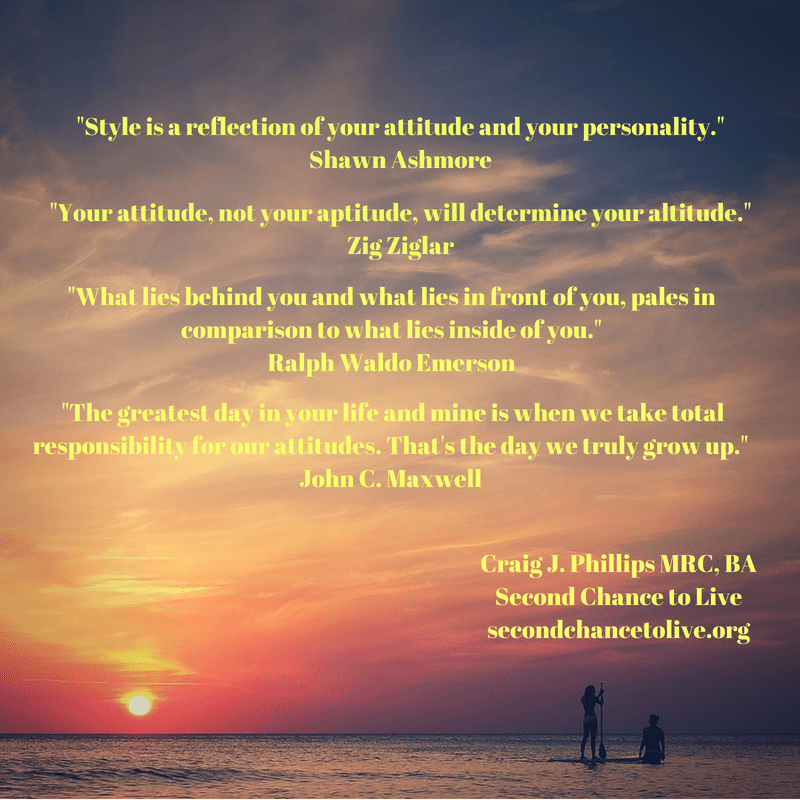 Craig’s personal stories provide insight for living every day life. Thank you for using your giftedness to help me. 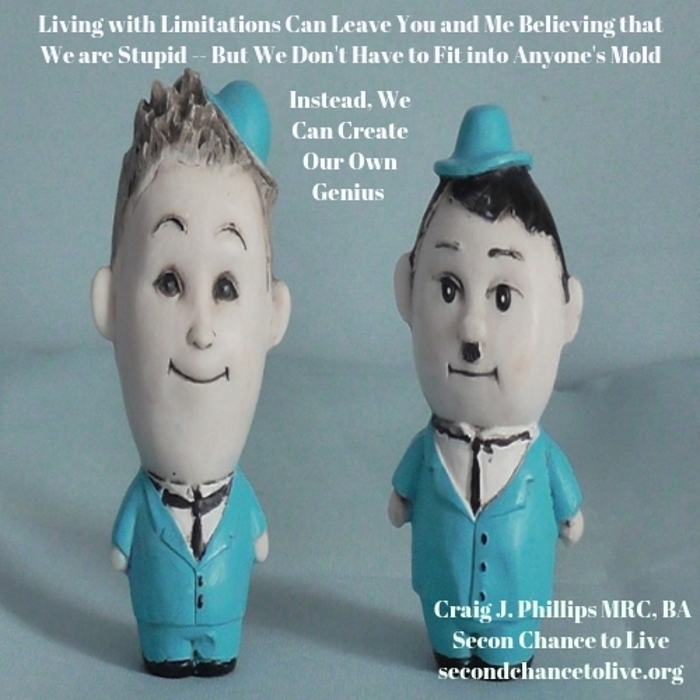 I came across Second Chance To Live as I was researching for a link regarding the “identified patient.” I was writing a blog regarding my own journey and recovery from neglect, and spiritual/emotional/verbal trauma and abuse; thus my search for a link. I wanted a link that was heartfelt, validating, informational, and empowering. I found several links and looked them over. One of Craig’s web post deeply resonated with me and I picked that particular article as the reference link on my blog. 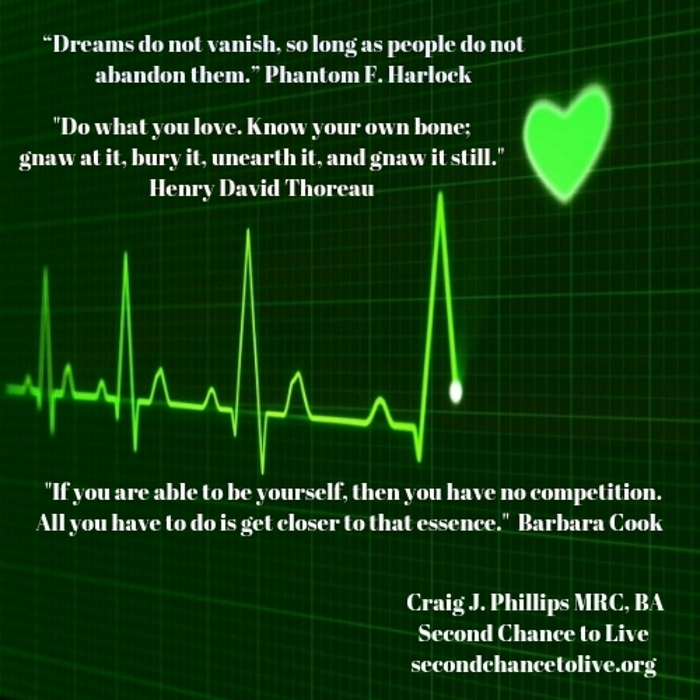 At the time, I also read other articles on Second Chance To Live. Shortly thereafter I met Craig via email and we have exchanged correspondence on and off. His correspondence has been genuine, respectful, down-to-earth, and inspiring. I am not challenged with a traumatic brain injury, yet Craig’s sharing’s are helpful for trauma across the board; not only traumatic brain injury. I find his approach and empathy, mixed with responsibility and valuable tools to help a sufferer learn to live again, empowering. I refer to his sharings from time to time to assist me in my own continued journey of re-discovery of life. Sometimes when we least expect it, we are blessed to cross paths with an authentic being who has the ability to leave a lasting deposit of love in our hearts as well as in our lives. Craig Phillips is such a person. Like many others who have written, I have had several brain injuries and complex PTSD. One day I found Craig in my email..I do not know how he got there…neither did he. Divine intervention I suspect. I was fighting for my life. My will to live was gone to the point where I had experienced a full life review while in a state of deep prayer. Craig directed me to his writings and reading them helped me. Then he started writing to me every couple of days. A joy. Over the past six months more of my soul essence has returned, and I am starting to feel better. Craig gently confronts me when my thinking is distorted…and reminds me who and what I truly am..because I forgot…His peaceful spirit,unconditional love and compassion have played a huge role in my ongoing healing…I am no longer hopeless or helpless. I even laugh occasionally. Craig is a blessing to me, and to all who connect with him. The essence of holiness is love. Craig embodies love. When you have been blessed by Craig, be prepared..your life might just change. Mine has. Craig has truly taken his second chance and made it a model for living with purpose. He is living with the essence of empowerment – embracing circumstance and creating from it a life which is not less but, more than it ever would have been. I founded Dreams for Kids 20 year ago as a place for youth to be empowered and to live a life of infinite possibilities. There are those who seem compelled to remind us what we have lost and what we cannot do. Craig reminds us that life is lived in the moment with the gifts we are given and the opportunities which are ever present. 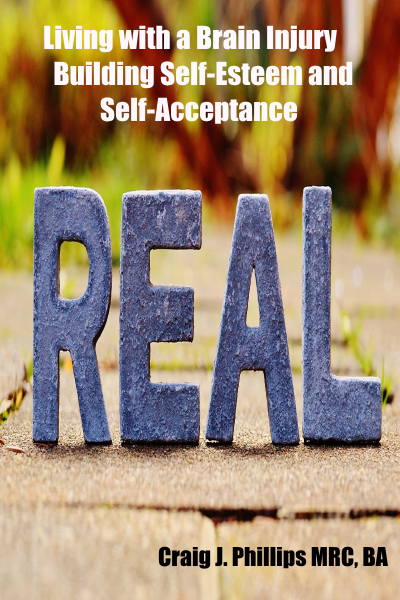 His principles of acceptance and empowerment are text book examples of how to live a full live. In making each day a good day, you have made your life a good life Craig, and quite an extraordinary one. I have only known Craig for a little a short time, but from the life experiences he has posted, he has a great attitude. Living with a disability is not always easy (I should know I have Spina Bifida), but Craig chooses to take the negative and turn it around to empower himself and others. I have added his blog to my own website, Empowering Jews With Disabilities. His message crosses all boundaries and religious beliefs. My life, and my friend’s lives that I have made through my own website are enriched by his online presence. He brings a voice to TBI that no one else does. Jen 2009 /2/15 at 6:58 pm Batemans Bay. My name is Jenny and I suffered a serious closed head injury in December 2004 when the car that I was driving hit a tree. I was unconscious when they found me and I wasn’t expected to survive the night. I spent 9 months in a rehabilitation hospital learning how to walk, talk, swallow & eat & use my fine motor skills again. 4 years later and I’m much better than I was, but I’m still not there yet. I live in the small town of Batemans Bay which is in Australia. Batemans Bay is about 5 hours down the coast from Sydney in New South Wales and I felt totally alone until I found Second Chance to Live. Almost 4 years into my new life as a brain injured soul a social worker gave me the link to Second Chance to Live. This is the best and most personal site that I’ve ever come across and I wish to applaud the creator (Craig J Phillips) for his tireless efforts in creating articles and offering unconditional support and encouragement to anyone involved in some way with a brain injury. There is no particular story that stands out to me as I quite often find myself agreeing with what he says. He has a way of articulating what many BI survivors are thinking. Craig (the creator) did say one thing that has made a huge difference in the way in which I live my life though. That statement will always stay with me. He said “life is for living, not merely surviving”. When I read that statement I realized that in the 4 years since my accident I had been hiding away from the world and just surviving, when I needed to be out there living my new life. I have been doing just that ever since and it has made a big difference to how I feel about my life. His words of encouragement and first hand experience have helped me enormously, so thank you for creating this site offering encouragement. Many people would feel “doomed” and think that the best of their life is over (I know that I once did), but you encourage people to make the most of their deficits/limitations and to use them as best they can to create a fantastic new life. He inspires me to remember that having a brain injury just makes me different and that I need to accept who I am and create a wonderful life for myself based on my capabilities. Craig suffered a brain injury over 40 years ago, so he has lots and lots of practical experience. He is more than happy to give unconditional support and encouragement, and I’ve found his articles to be a valuable reminder that I’m a special & unique person. I urge you to tell people about this site as it is by far the best brain injury site that I’ve ever encountered. 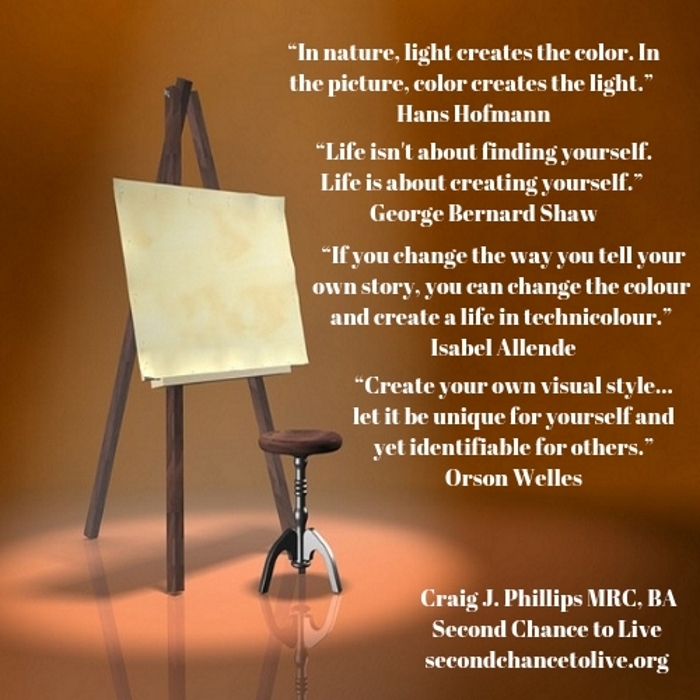 Thanks Craig for creating Second Chance to Live. 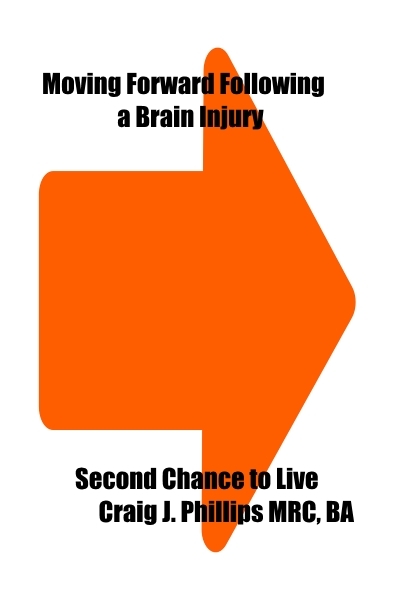 I found my way to the “Second Chance to Live” site while doing searches on traumatic brain injury. The author of the site, Craig J. Phillips, is nothing short of an inspiration to me. I think that anyone can benefit from his posts, whether it’s someone with TBI or another chronic illness. It is not an exaggeration to say that I always take time to savor what I’ve just read after reading one of his latest posts. I especially appreciate that he knows what having TBI is like and oftentimes his posts are something that I really needed to read right at that moment. As I previously wrote- even if you don’t have TBI, I think anyone can benefit from his posts. He’s somehow able show me rainbows while acknowledging the dark clouds. I can’t think of any other way to describe it. What a great inspiration for people everywhere to keep trying even though life may not be easy or what they want. I had something similar called ocular kerotitis and lost the vision completely in one eye and partially in the other due to a sulfa drug reaction. The doctors weren’t sure if I would get my vision back partially or completely. It is enough on top of the already difficult day to day living to know that God is putting more on your plate. It is definitely how you as an individual choose to deal with it and any other situation life throws at you. Will you fall and not be able to go on or is just another part of life? I recovered completely and take it not only as a learning experience but also a wake up to be appreciative of my vision and the world I can see around me. Craig is incredible at drawing the best out of any terrible situation. It is part of life, so accept it and move on the best you can. Thank you for sharing your thoughts with us! From what I have read on your site so far, you do much more than motivate, encourage and empower your readers. In my eyes, you are more like the Beacon of Light emitting from a Lighthouse, beaming in the darkness, to show the way to those of us who feel lost in the sea of uncertainty…. 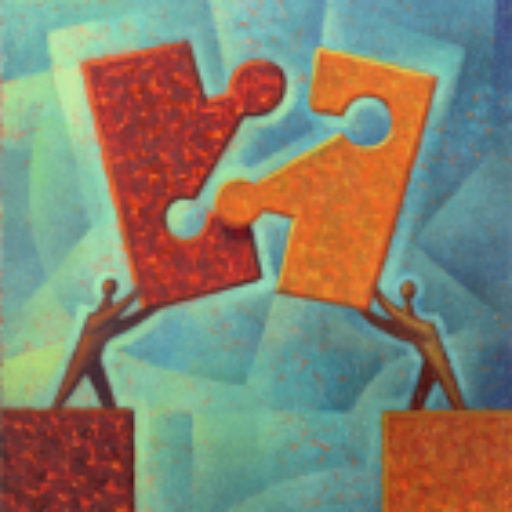 As program director for The Brain Injury Association of Niagara, one of my responsibilities is to serve as facilitator for the peer groups for individuals who have sustained an acquired brain injury. We appreciate your expressed consent to allow us to share a selection of the articles in your Second Chance to Live blog with our participants. Craig you personify not only what it is like for individuals who have sustained brain injury, but more importantly, to strive to be the best you can be, and make the most of your talents and gifts that you so generously share through the process of reciprocity…….by giving back so others may learn………families, caregivers, and especially providing enlightenment for those individuals who have sustained brain injury, who may identify, learn and gain wisdom from your insightful writing. It is important for us to promote awareness about brain injury as this does not resonate with the general public, unless it has touched their lives on a personal basis, as opposed to the topic of cancer, or diabetes for example. You serve as a beacon to show the way……….reminding us that we do have control over the choices that we make…how we choose to act as oppose to react, maintaining a positive attitude and “by” not being limited by our circumstances or situation but encouraging us to look at our possibilities. 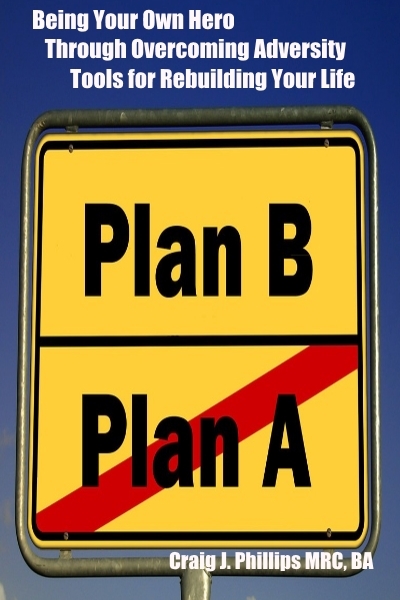 Living life one day at a time and applying these strategies become an integral component in order for us to continue to moving forward in our personal journey post injury and that there is life after brain injury with many possibilities yet to unfold. Your inspirational blog provides opportunities for others to abstract and apply some of these positive messages in their daily lives, and we hope that you will continue to share your messages of hope and encouragement by inspiring others to strive to new levels of achievement by turning adversity into opportunity! While we cannot change the direction of the wind, we can adjust our sails to meet the winds of change. Craig you remind us that those who weather change best are those who choose to embrace and adapt to it. Your inspirational messages continue to inspire others to chart their own course. 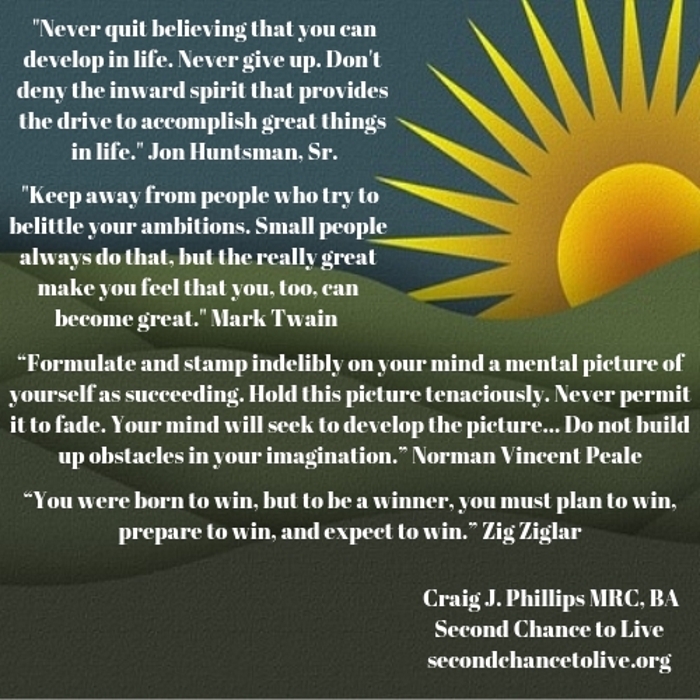 This open letter endorses the powerful message Mr. Craig Phillips, MRC, BA, eloquently writes about as creator and author of the website, Second Chance to Live, (http://secondchancetolive.org/), and speaks about as an advocate and motivational speaker for people living with brain injury. Hinds’ Feet Farm is thankful that Mr. Phillips is part of our innovative, post-rehabilitation, community-based, day program as a contributing educator to our community. The Hinds’ Feet Farm Day Program is a paradigm shift from the traditional medical, treatment, model for people living with brain injury, to a model that embraces a holistic health and wellness orientation, empowering members toward occupation and meaning in life post injury. Hinds’ Feet Farm is a person-centered, member empowered, self-determined, free choice, conceptualized and driven program. Members are self governing through the fluidity of the program by self-designing opportunities to engage in reestablishing and empowering occupation. Program staff, family and professional caregivers, in-kind community volunteers and student interns are guides for members in opportunities for exploration, discovery, confidence and self-esteem in their new identity and meaning in life post-injury. Hinds’ Feet Farm initially invited Mr. Phillips to be a one time, guest speaker at our program. However, after hearing his message of hope and inspiration, members of our brain injury community wanted to hear more of how they too could embrace a second chance to live. With the driving force of triumph and celebration of the human spirit post brain injury, Mr. Phillips joins us monthly to share his life’s wisdom. Mr. Phillips’ is a peer mentor and life coach cheering our members on towards greater life fulfillment. 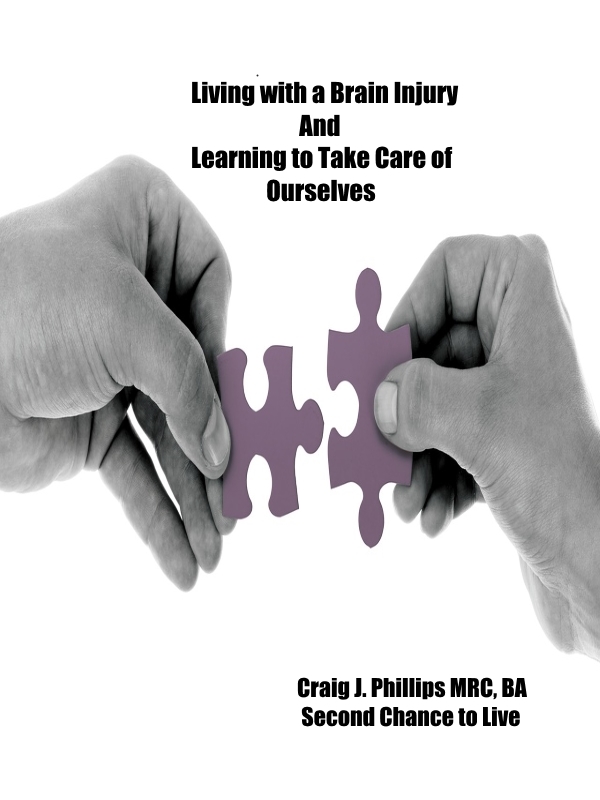 Mr. Phillips has a unique role in the local brain injury community of North Carolina and internationally, as a person living with a brain injury and as a professional in the rehabilitation counseling field. He knows first hand the brain injury continuum of care both as a survivor, and as a “thrivor”. 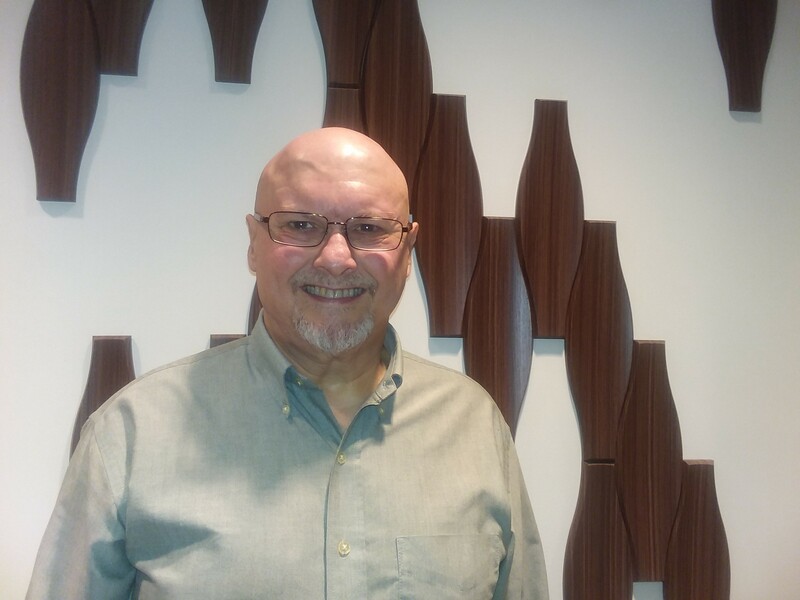 My Phillips experience, strength and hope as a traumatic brain injury survivor and a masters level rehabilitation counselor enables him to immediately identify with both survivors and professionals simultaneously. 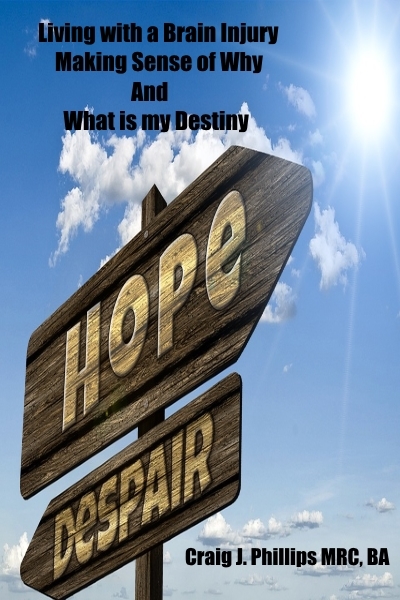 Mr. Phillips tailors each of his monthly session to our community’s needs and based on his blog postings, such as The Flight of the Butterfly, Traumatic Brain Injury and Isolation, What is my Destiny?. Mr. Phillips invites the members of our brain injury community toward a greater quality of life and their own second chance to live through well formatted presentations, opportunities for introspection to rediscovering one’s mission and vision in life through meaning and purpose, employing professional counseling skills, harnessing the power of group dynamics and process. Ever sensitive to and conscientious of his audience, Mr. Phillips welcomes the immediacy of feedback and lively dialogue. Mr. Phillips’ heartfelt message is masterfully crafted, awakens his audience to “carpe diem,” to pursue our dreams, and to live life to the fullest. Hinds’ Feet Farm endorses and appreciates Mr. Phillips’ message that invites and empowers persons living with brain injury toward their own health and balance in their life journey. We are thankful for our reciprocal relationship with Mr. Phillips. Thank you Craig! Please feel free to contact me if I can be of further assistance.